If you’re looking to party with a beach-scene backdrop, Puerto Escondido is a great place to get your dance on for a few nights. It has lively bars, a couple of rowdy night clubs, as well as beach parties. The most lively times to visit are the religious holidays, from December 20th to January 5th and Easter weekend, when people from all over Mexico descend on Puerto Escondido to rage well into the dawn. The summers belong to foreigners, particularly in July, when a large influx of Australian surfers hit the beach. The most party-centric hotel in town is Hotel Rockaway. It has a Miami-meets-Greece feel to it; the rooms are modern, minimal and white; the floors are stylishly stained concrete; the walls are white stucco. The hotel is so close to several active nightspots that you won’t even need your own music — the area’s DJ’s play plenty loud enough to lend their tunes to the party in your hotel room — alllll night (bring good earplugs!). The suite you’ll want to reserve is the penthouse, which comes with a private pool and a phenomenal view. 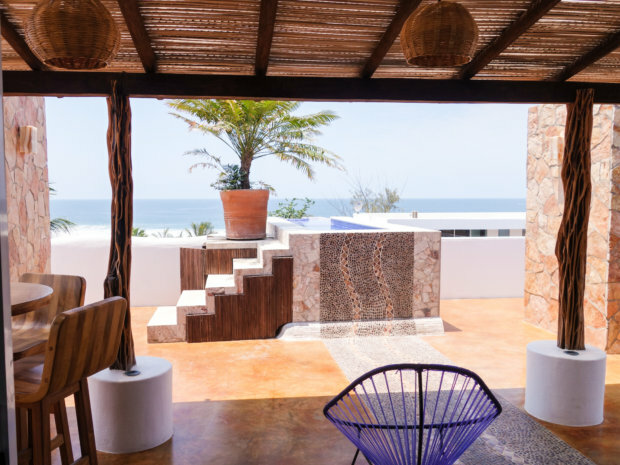 If a rock star were to visit Puerto Escondido, this is where they’d stay. I can imagine plenty of people “makin’ it rain” in this “baller” suite. 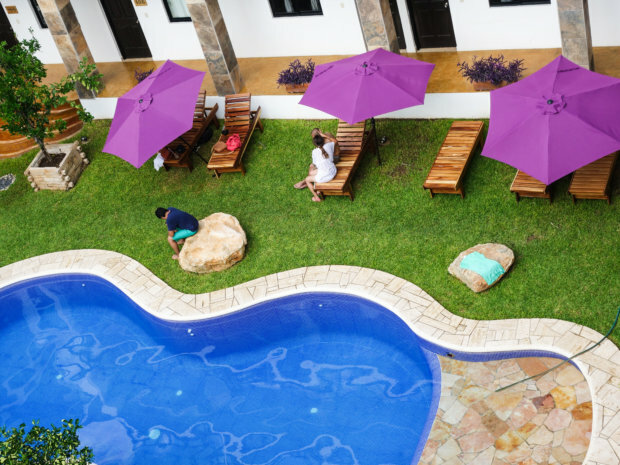 Not only is it by far the most private accommodation at Rockaway (the others all have balconies that face the other rooms), but you’ll be glad for the private pool mid-day. 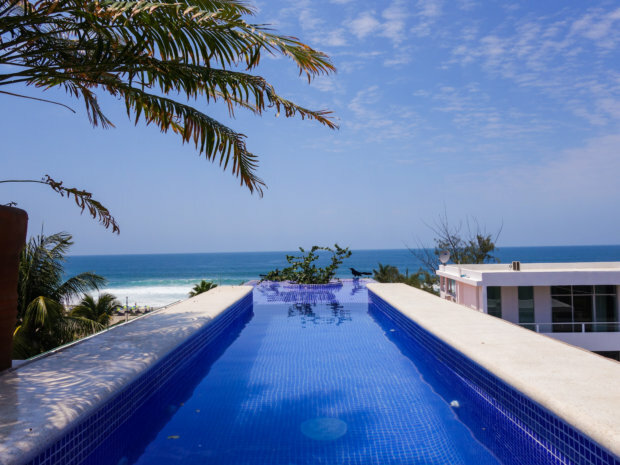 The suite is so complete, in fact, with its kitchen, living room, soaker tub, outdoor lounge area and a pool that overlooks the ocean, that you may find you rarely want to leave. It has a thatch roof, great lighting, and interesting art on the walls. 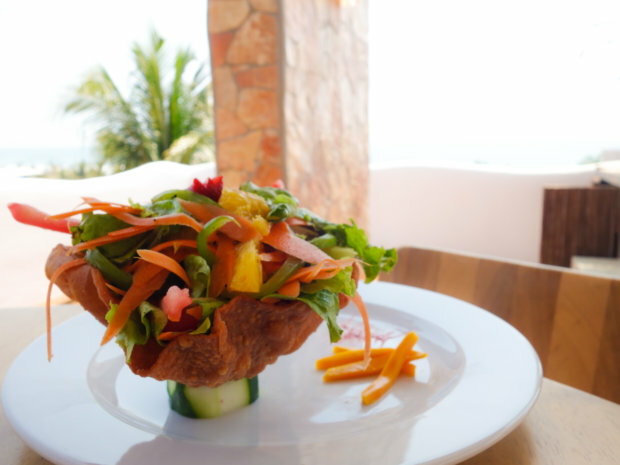 And whether you’re hungover or not, room service at Rockaway is simply delicious — we highly recommend the guacamole and mahi mahi, as well as their smoothies.